"A colorful fabric 'caterpillar' basks in the noonday sun." Artist comment: "Some amazing air creatures appear on the beach at the annual kite festival in Long Beach, Washington. They can be big and bold and beautiful, limited only by the designer's imagination and creative skill. 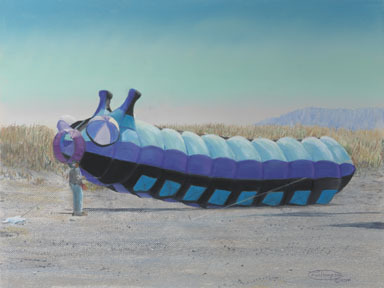 This blue and purple 'caterpillar' is over 45 feet long and dwarfs the man at it's nose. This is a pastel on Canson Mi-Teintes textured paper. Starting with a basic sketch, I blocked in the large areas of sky and sand, then the grassy dunes. I next focused on the 'kite' and it's shadow, paying attention to the lights and darks to define the shade of the caterpillar's segments. I painted the figure, then 'dotted' in the rocks on the beach, then, lastly, the 'tie-down' lines." "Caterpillar" is a limited edition, giclée print from an original pastel painting by Carol Thompson. The edition includes 3600 authorized, signed, limited edition prints (3500 numbered and 100 artist proofs). Release date is October 2015. Image size and substrates vary. All prints are signed and numbered by the artist and include a certificate of authenticity. Paper prints are shrink wrapped on foam board. Canvas prints are coated with a protective spray.